Contains peanuts. Manufactured in a facility that also processes dairy, soy, egg and tree nuts. 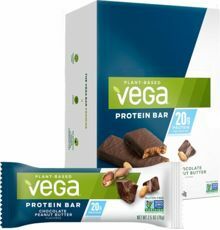 Pea Protein, Organic Agave Syrup, Brown Rice Protein, Organic Sugar, Tapioca Syrup, Vegetable Glycerine, Peanut Butter, Palm Kernel Oil, Natural Flavors, Organic Agave Inulin, Cocoa Powder, Rice Starch, Chocolate Liquor, Cocoa Powder (Processed With Alkali), Sunflower Oil, Organic Peanut Extract, Sea Salt, Sunflower Lecithin. Do not use if seal is broken. Store in a cool, dry place away from direct light. Contains almonds. Manufactured in a facility that also processes peanuts, dairy, soy, egg and other tree nuts.